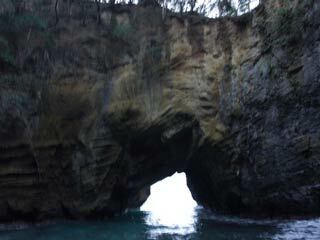 Dragon Cave (竜宮窟, ryugukutsu) is the cave shaped in the coastal line of Izu Peninsula. It has national rock bridge and huge hole on the roof. The water come from the bridge, also considered as the gate, is very mysterious and give you the spiritual moment. There is parking and restroom. In summer parking is not free. 3. take taxi to Ryugukutsu.